The President's address, which reflects the government's view, assumes significance as it comes ahead of the Lok Sabha polls, expected to be held in April-May. New Delhi: Presenting a virtual report card of the Modi government’s tenure, President Ram Nath on Thursday highlighted its various development works and commitment to social justice, as he asserted it has worked to build a “New India” after assuming power in 2014 when the nation was passing through “uncertain times”. In his address to the joint sitting of Parliament at the beginning of the Budget Session, Kovind also referred to the contentious Rafale deal, saying that the Indian Air Force will welcome the ultra-modern fighter aircraft in the coming months to strengthen its strike capability after a gap of many decades. 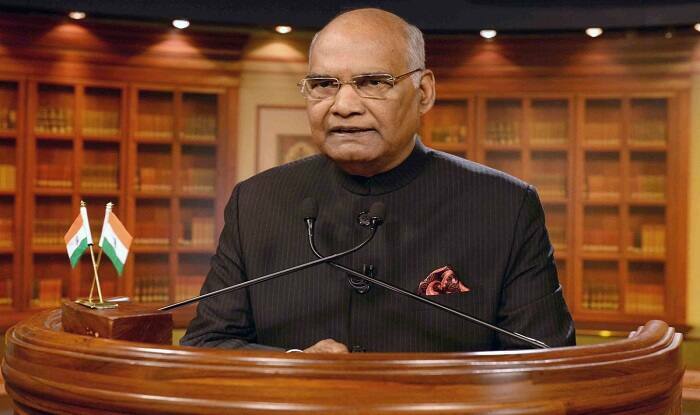 The President’s address, which reflects the government’s view, assumes significance as it comes ahead of the Lok Sabha polls, expected to be held in April-May. The 10 per cent reservation for the general category poor, the triple talaq legislation and the controversial Citizenship Amendment Bill also figured in his over an hour-long speech at Parliament’s central hall in the presence of Vice President M Venkaiah Naidu, Prime Minister Narendra Modi, Congress president Rahul Gandhi, Union ministers and other MPs. “Prior to the 2014 General Election, the country was passing through a phase of uncertainty. After the elections, my government assumed charge and vowed to build a New India. A New India with no place for imperfect, corrupt and inertia ridden systems,” he said. In the last four and a half years, the government has infused new hope and confidence among the people of the country, enhanced the country’s image and has effectively brought in social and economic change, he said. From day one, the government’s mission, based on transparency, was to improve the lives of citizens, to eradicate their difficulties owing to poor governance, and to make sure that the benefit of public services reach the lowest strata of the society, he said. Highlighting the government’s achievements and various welfare schemes, Kovind said 21 crore poor people were covered under the PM’s life insurance scheme, while over 2 crore households got power connection as part of the Saubhagya scheme. “Under the Swachh Bharat initiative, the government has built nine crore toilets,” he said. The president also described 2019 as a significant year for democracy as the country is observing the 150th birth anniversary of Mahatma Gandhi. Be it cities or villages, the government has worked towards strengthening the health care infrastructure by building new AIIMS and wellness centres across the country, he said. “The country was going through times of uncertainty before the 2014 Lok Sabha elections, and after the polls my government resolved to make a New India,” the president said. Highlighting the governments achievements and various welfare schemes, Kovind said 21 crore poor people were covered under the PM’s life insurance scheme, while over 2 crore households got power connection as part of the PM’s Saubhagya scheme. “Under Swachh Bharat initiative, the government has built nine crore toilets,” he said. Touching on the triple talaq bill, which has been stuck in Rajya Sabha due to stiff opposition after being passed in Lok Sabha, he said the BJP-led NDA government is striving hard to get the triple talaq bill passed by Parliament to “liberate Muslim daughters” from a life of fear and anxiety and to provide them with equal right. On the Rafale issue, the President said the government believes that neglecting the country’s defence needs even for a moment is detrimental to the present as well as future of the country. “After a gap of many decades, the Indian Air Force is preparing to welcome, in the coming months, its new generation ultra-modern fighter aircraft Rafale and strengthen its strike capability,” he said. India displayed its new policy by carrying out surgical strikes on terror launch pads across the border, he said. Citing other achievements of the government, Kovind said the number of people filing Income Tax returns have doubled from 3.8 crore to 6.8 crore under its tenure and added that over 73 per cent of around 15 crore Mudra loan beneficiaries are women, he said. Approvals for works costing over Rs 66,000 crore out of Rs 80,000 crore package have been given by the government for development in Jammu and Kashmir, he said, asserting that the government to committed to the state’s growth.